Serve a juicy and succulent cut of meat when you make our Cedar Plank Southwestern Steak recipe. The clever plank grilling and rub give Cedar Plank Southwestern Steak a little heat and a whole lot of flavor. Try something new today with our Cedar Plank Southwestern Steak recipe. Immerse plank in water, placing a weight on top of plank to keep it submerged. Soak 4 hours. About 1-1/2 hours before ready to grill the steak, combine sugar and seasonings; rub onto both sides of steak. Refrigerate until ready to grill. Heat grill to high heat. Grill steak 2 min. on each side; remove from grill. Remove plank from water; brush top of plank with oil. Top with steak. Place on grill grate; cover with lid. Reduce grill to medium heat. Grill 15 min. 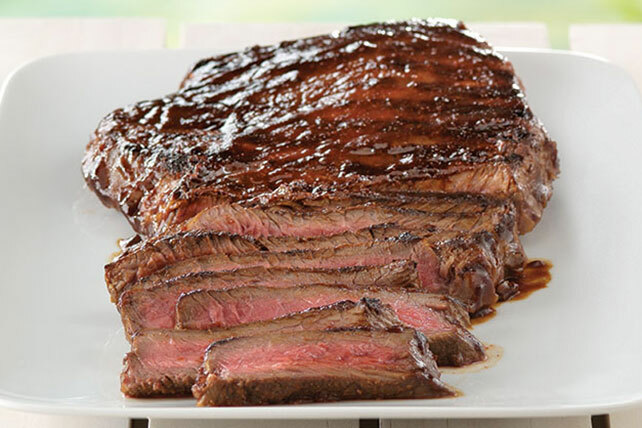 or until steak is medium doneness (160ºF), brushing with 1/4 cup barbecue sauce after 10 min. Remove steak from grill; discard plank. Cover steak loosely with foil; let stand 5 min. Cut steak across the grain into thin slices. Serve with remaining barbecue sauce. UNTREATED cedar planks, which are sold for this purpose, can be found at most specialty food stores or some grocery or hardware stores. During cooking, check periodically to make sure that the plank is not on fire. Since the plank can ignite when exposed to flames, it is best to keep a spray bottle of water close at hand if needed to extinguish any flames. Searing the steak a few minutes on the grill before placing it on the plank gives it the traditional grill marks, which helps prevent the meat from looking and tasting steamed. Serve with hot grilled corn on the cob. The cedar plank can be soaked up to 24 hours before using as directed.